A family run business since 1660, the Heraeus company was made official in 1851 by Wilhelm Heraeus. The business later merged with Argor, a Swiss company, in 1986 to become Argor-Heraeus. The company is now one of the leading precious metal refiners globally and are well placed in the supply chain to provide their services to a wide range of customers from mining, bullion dealers and industrial consumers. The company has had many years experience in the luxury products sector providing numerous products for the watch and jewellery making industries. A member of the LBMA, Argor-Heraeus also have a strict "Supply chain due diligence policy" to ensure a green supply chain. 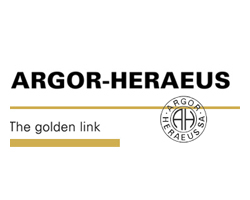 We stock a wide range of Argor-Heraeus Premium Bullion Bars in Gold from 1 gram to 50 grams in square bars and 1oz to 100 grams in round bars.